There are many different controls that can be added to a frame or panel, including labels, textboxes, buttons, drop-down selectors, check boxes, radio buttons, and sliders, just to list a few. 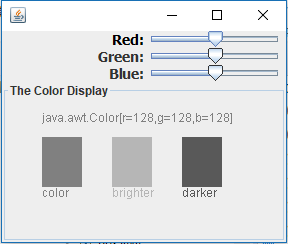 This next figure shows the code for a ColorPicker program that allows the user to use sliders to determine the RGB (Red/Green/Blue) values for a color. * color both as a font color and as a colored rectangle. * the the getInt() method is used to retrieve their data. * three JTextFields into which the user can type RGB values.